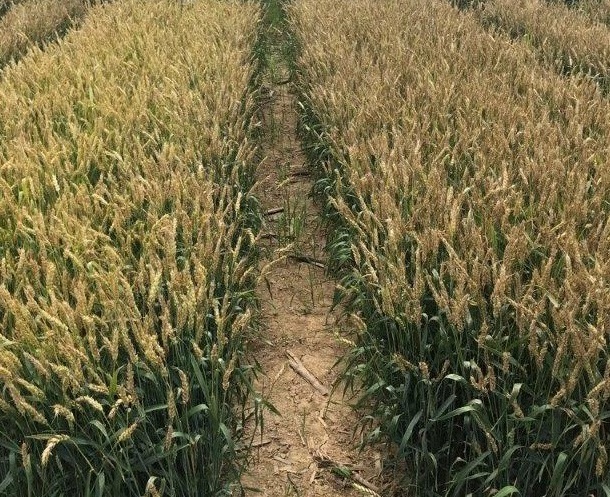 Wheat treated with Miravis® Ace (left) is significantly healthier than the untreated wheat (right). To say 2019 has gotten off to a rough start would be an understatement. Widespread flooding, brutal cold and depressed markets are just a few of the hurdles you may be facing. While you regroup and evaluate what other ups and downs the season may hold, Fusarium head blight (head scab) management might be on your mind, too. If you’ve had to manage head scab in the past, you understand the level of damage it can cause when it comes to yield and DON levels. More than likely, you’ve experienced frustration with the limited application window of older fungicides at flowering, and possibly experienced poor disease control from your application because you couldn’t cover all your acres in time due to a weather delay or an over-booked applicator. With the unpredictable weather we’ve seen so far this year, don’t leave your head scab application to chance. Knowing you don’t need any more setbacks, one technology advance could help you enjoy more freedom and better control of head scab in 2019. Miravis® Ace fungicide, the newest fungicide technology for controlling head scab, allows you to apply as early as 50% head emergence. Unlike older fungicides that must be applied at flowering, Miravis Ace offers you much-needed application flexibility without sacrificing efficacy or yield. Powered with propiconazole and our latest SDHI technology, Adepidyn® fungicide, Miravis Ace has greater power and stamina to control head scab for longer, protecting both the main head and tillers. With this option, you can plan ahead and better manage the unexpected, taking the frustration out of head scab control. In trials comparing Miravis Ace to older fungicides at both 50% head emergence and flowering, Miravis Ace consistently provided better head scab control with better test weights and higher yields than older treatments. Miravis Ace is now being offered in a premix formulation for a more convenient application and improved head scab protection. ©2019 Syngenta. The trademarks or service marks displayed or otherwise used herein are the property of a Syngenta Group Company. All other trademarks are the property of their respective owners. *Prosaro 421 SC and Caramba are not labeled for use at 50% head emergence, and no recommendation or suggestion for use at this timing is being made. Data is intended solely for comparison at this application timing with Miravis Ace, which is labeled for use as early as 50% head emergence.